One of the most common ways for people to exercise nowadays is by making use of a trampoline. Instead of going through an intense workout in the gym that makes you feel exhausted, it can be more exciting if you will try jumping on a trampoline. This device is not only used for recreation because it also has benefits into the body. You can look for a trampoline for kids and adults making it suitable for the whole family. A trampoline is a type of device that is made up of a steel frame with a stretched fabric. Users will have to jump on top of the trampoline and the can even do the tumbling if it is large. A trampoline can be used for recreation and competitive purposes. They differ with their features so you have to decide what kind of trampoline you need if you want to get expected results. For recreational trampolines, their canvas can resist water and available in different shapes and sizes. You can usually found this type of trampoline in children’s playground, gyms, health clubs, and this is also the one that you can place in your house. On the other hand, competitive trampolines are more durable with a special fabric. You can easily transport this trampoline which is necessary for people who compete in different places. They are available in a standard size and shape with lots of coiled springs so that users can make difficult stunts and can bounce higher. 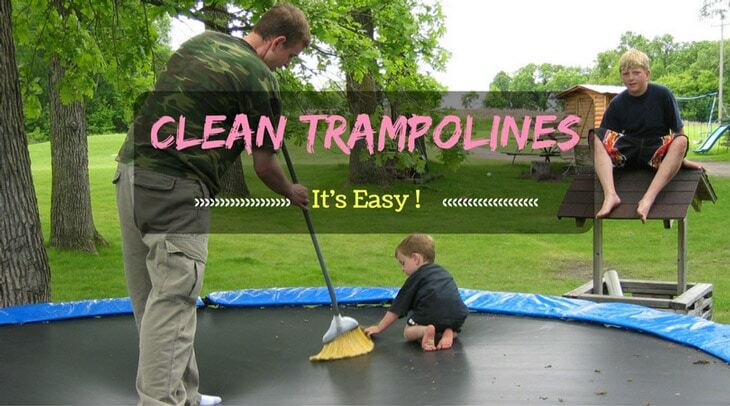 Do You Know How to Clean Your Trampoline? The best place where you can put the trampoline is outside your house so you can have enough space that allows you to jump higher. Knowing that not everyone has a large house, for sure you are afraid to use the trampoline inside because your head might hit the ceiling. Though placing your trampoline outside can make the experience more exciting, cleaning it can be the problem especially if trees are around. It is important that you clean the trampoline once in a while to prevent accidents especially if you allow your kids to use it. You have to make sure that you purchase a trampoline with excellent support if it is for your children to be assured that they are safe. Trampolines easily get dirty outside because of dust and leaves. Regular cleaning is required not only to secure the users from unwanted incidents but also to check the parts of the device if they are still in good condition. Listed below are some of the things you need when cleaning a trampoline. The first thing that you have to do is to remove the leaves on the surface of the trampoline by using a broom. You also have to get rid of the dirt in the trampoline’s mat and springs. With the use of a garden hose, you have to pre-soak the trampoline including the mat, metal legs, and springs. You have to mix a part of a liquid soap to warm water that you will use for washing the trampoline. For the jumping mat, you can use a towel while for the springs you have to use a toothbrush so you can clean the spaces in between. Get the hose and rinse the trampoline. If you want to rinse the device thoroughly then you might need a high power hose. Dry the legs and springs of the trampoline by using a towel to prevent it from rusting. Let the mat dry naturally by exposing it to the sun. If you see small spots or formation of rust on the springs of the trampoline you can make a solution that can help you get rid of it. You have to mix three parts of water into one part of vinegar. By using a toothbrush, scrub the affected area with the solution and then rinse it well. You have to make sure that there is no soap left on the mat if you don’t want it to become sticky. How to Purchase the Best Rectangle Trampolines with enclosure?